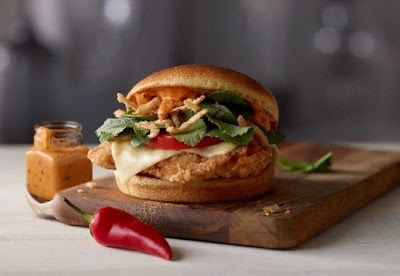 Starting July 31, 2017, McDonald's adds both Sriracha and kale to their sandwiches with the nationwide arrival of the new Signature Sriracha option to their Signature Crafted Recipes line. The new flavor features Sriracha Mac Sauce, crispy onions, fresh baby spinach and kale, tomato and a slice of white cheddar cheese to go with your choice of bun and patty. It marks the first time that McDonald's has added kale to a sandwich on the national menu (kale is currently only found nationally as part of McDonald's salad mix). According to the company, the new flavor will join Pico Guacamole and Sweet BBQ Bacon options on the menu (which could mean that Maple Bacon Dijon may be moving on). With the launch, McDonald's will make Sriracha Mac sauce available for a limited time as a dipping sauce of Chicken McNuggets and fries. I actually reviewed the Sriracha option last summer as it was testing here in Southern California. While kale is currently limited to salads (and soon for burgers/sandwiches) at McDonald's nationally, it's also available in Southern California as part of a Breakfast Bowl.